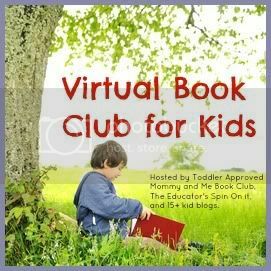 The bloggers of the Virtual Book Club are celebrating the works of Tomie dePaola this month and so my class has been reading a few of his books including our most recently read book titled, “The Popcorn Book”…. “The Popcorn Book” by Tomie dePaola has two stories going on at one time. One story is about two children going through the process of making a bowl of popcorn and the second story is about the history of popcorn…. Once the corn cobs were broken in half, the corn seeds were much easier to pluck off the cobs…. One got hot and it went POP! So this was our fun day of exploring “The Popcorn Book” and real popcorn in our outdoor classroom centers. Don’t go away – see the linky at the end of this post for more great Tomie dePaola books and activities! Link up only posts inspired by Tomie dePaola that share children’s book inspired crafts, activities, recipes, etc. Any other posts will be deleted. Such wonderful activities and Blog Hop. We had a dog once that loved popcorn. I’m sure there are many critters who enjoy the smell, taste and texture of popcorn – and it’s an inexpensive food for adults. This post is making me want to pop some now and sprinkle cheese on it. Yummm. Also dance and pop like popcorn during the chorus. Music into this. I will try that finger play. Thanks! We made popcorn for snacks. I placed a sheet in the middle of the floor, while the children sat on the edge of the sheet. We then talked about the unpopped corn as I turned the popper on, (without the top on the popper) and asked questions, what does it smell like?, can you hear it? Then to their complete surprise the popcorn started flying out of the popper. This was such a huge hit!!! The children would still be talking about it months later. I would warn the children not to touch the popcorn until the popper had stopped popping. This is an adorable activity, but popcorn is a serious choking hazard for children under 5. I’m not sure how old your students are, so perhaps they are old enough for it. I’m not trying to be a downer (love your site), or a nervous nellie, just want to offer this information as a precaution. I love your popcorn bin! My boys would love playing in that. They would probably eat the popcorn but maybe they’d play for a little bit 😉 I’m going to try it! I did this activity last Friday with the kids in my class. It was a huge it. I also added popcorn at the art table with droppers and food coloring. It was a lot fun and we topped it off by eating popcorn. Thank you so much for such a fun activity. Yay! I am so glad you stopped by to share your fun with me!